The Atkins Diet is predicated on the idea that the human body, when deprived of carbohydrates, is forced to burn fat for energy. Introduced by Dr. Robert Atkins in the 1970s, the four-phase Atkins Diet requires followers to consume between 20 g and 100 g carbohydrates per day, depending on the phase and the dieter’s level of physical activity. Some Atkins dieters use pork rinds to mimic high-carb foods disallowed by the diet. Pork rinds, or chicharrones in Spanish, are pieces of deep-fried pig skin. Traditional dieters tend to avoid them due to their high fat content -- about 10 g fat and 160 calories per 1-oz. serving. 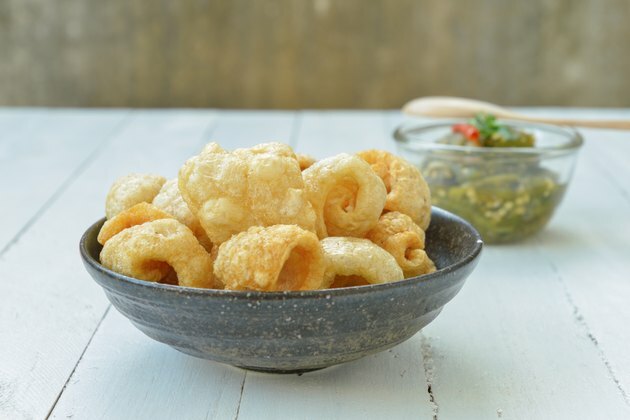 Atkins followers and other low-carb dieters, however, prize pork rinds because they contain absolutely no carbohydrates and contribute about 18 g of dietary protein per ounce. Pork rinds are crunchy and light, with a vaguely bacony taste that varies in intensity by brand. Some manufacturers offer flavored varieties such as barbecue or salt and vinegar. Pork rinds are an option for Atkins dieters who seek a crunchy, salty snack fix without resorting to high-carb options such as potato chips -- a definite no-no at 14 g carbs per ounce. If you choose a flavored variety to snack on, check the ingredient list for hidden carbs -- there may be sugars in the seasoning. Low-carb online forums abound with recipes that employ ground pork rinds as a substitute for breading. You can grind the rinds in a food processor or by placing them in a zipper-top bag and crushing them with a rolling pin. For a low-carb version of deep-fried chicken, for example, dip chicken pieces in a traditional buttermilk egg wash, then coat them with pork rind crumbs and fry as usual. You can use a similar treatment for pork, fish and vegetables. If you can spare a few carbs, mix a few spoonfuls of soy flour, grated Parmesan cheese or low-carb baking mix in with the rinds to create a breading with a richer texture. Crushed pork rinds can stand in for bread crumbs and other carb-laden toppings on casseroles and in foods prepared au gratin. Some cooks have gotten even more inventive -- a pizza crust recipe circulating on a variety of low-carb websites uses pork rinds, eggs, mozzarella and Parmesan baked in a nonstick pizza pan. You also can use ground pork rinds to help bind meatballs or create a low-carb poultry stuffing.